In 1940 there was still a Jewish baker in Meppel at 9 Voorstraat: Joseph Schaap. He was born at Vriezenveen on 20 January 1892 and was married to Jetje van Zuiden from Hoogeveen, who was born on 14 February 1892. 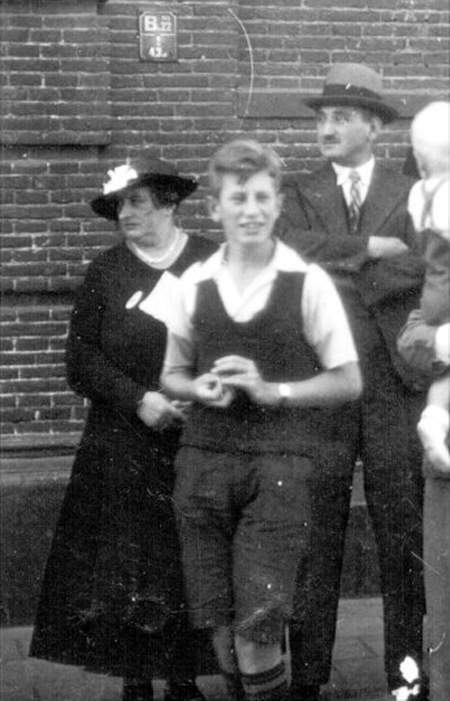 They had two children: Henriëtte (Jetje), born in Meppel on 16 September 1924 and Marcus (Max) born in Meppel on 24 October 1928. Joseph was the last Jewish baker in Meppel. Also before the 20th century there had always been a number of Jewish bakers in Meppel like Van Geens, Keizer, Pels, Klatzer, Van Emmen and Schaap. Van Geens who lived at 32 Hoofdstraat was famous for his Dutch rusks, which were sold in several other places. Van Geens, who descended from a family who had lived in Meppel since 1700, took great care over his rusks. He got very angry when they got wrong. He then had a drink in a nearby pub and went back home to smash what he had just baked and started afresh. In 1940 there was only one descendant of his in Meppel: Mrs. Bertha van de Rhoer-van Geens, the wife of Joël and mother of Jacob and Eduard. Of the names of the bakers we have only left the name of Pels in Pelssteeg. 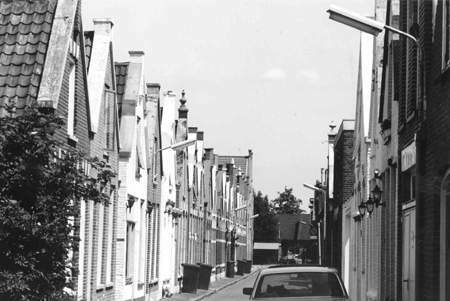 This alley, which led to Maatkade, was one of many alleys in Meppel. Pels was also a slum landlord who had eleven single-room houses built in this alley in order to let them. With the renovations in the town the alley at first disappeared, but it was restored again. The Schaap family from Voorstraat. Baker Schaap not only sold his ware from his shop in Voorstraat, he also delivered the bread at the homes of his clients, as was usual in those days. And … also on Sunday mornings as befits a Jewish baker. He then delivered to Jewish and non-Jewish clients his famous ‘jodengalgjes’ or ‘galletjes’ and of course his matzos (unleavened bread). Being open on Sundays was apparently financially attractive, because he even mentioned it in the 1940 telephone directory: ‘Schaap, J. Brood- and banketbakker (confectioner). Open all day on Sunday)’. In my form at the Zuiderschool were Ernst van Esso, Wollie Zaligman and Max Schaap. Ernst lived next to Tivoli, his grandmother lived like us in Emmastraat’ Wollie lived on the corner of Emmastraat and Wilhelminastraat and Max in Voorstraat. Max was such a sweet and handsome boy, I can still picture him. Jetje Schaap was in my dancing class. She was really too young  still a child  and she had these flat shoes, so that none of the boys asked her to dance with him. When the dancing master said: ‘Ladies ask a gentleman’, the boy she chose was not altogether pleased. Father, mother and son Schaap in front of the Dutch Reformed Church in 1st Hoofdstraat. Nevertheless the end came quite sudden, although they had had a lot of trouble before. In May 1941 their wireless was taken from their home and Max was no longer allowed to go to the Zuiderschool, the school he loved so much. When his friends were at school he had to stay at home and only after school he could play with them. Only in February 1942 there came an alternative: a Jewish primary school in the Theophylus building, but not for long. His sister was at Domestic science school, then called ‘Vrouwenarbeidschool for Meppel and surroundings’, but she was no longer admitted either. For her there was no alternative, so she helped her parents in the bakery. This also came to an end as the Germans were not keen on Jewish shops. The isolation of the Schaap family more and more increased, especially when their shop was closed by order of the Germans in the course of 1941. The stock was taken away as usual, but the liquidation was only at 23 July 1942. Father Joseph was already at the work camp at Orvelte, when his wife Jetje had to go to the Chamber of Commerce to sign a statement that their shop had gone into liquidation. Only on 18 February 1943 the business was formally liquidated by Richard Becker who settled this for Omnia. After the Schaap family had gone, Mr. Feenstra, also a baker and his family came to live there, so that the bakery was continued. At first Mr. Feenstra rented the premises but after the war he bought them. Of the Schaap family nobody was alive any more then. 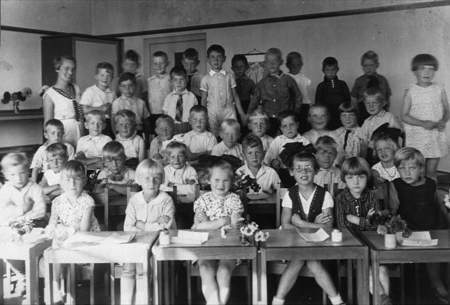 Max Schaap (top row, 8th pupil from the left) at the Pelikaan kleuterschool (kindergarten) in 1934. 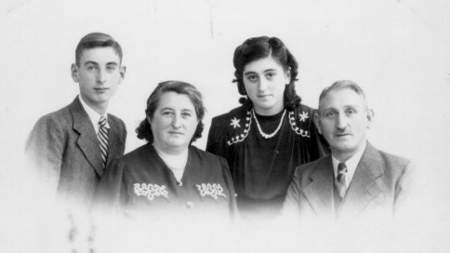 Jetje, Max and Henriëtte were expelled from their house on 3 October 1942 and united with their husband and father who had been forced to work in Orvelte two and a half months before. Two days later they were all transported to Auschwitz, where the mother and her children were killed on 8 October. Joseph, however, was killed much later, somewhere in Poland on 31 December 1943. Just imagine, spending your days in Auschwitz or a satellite camp, without your family under the most miserable circumstances and in continual fear. A dramatic end for the last Jewish bakery family in Meppel.